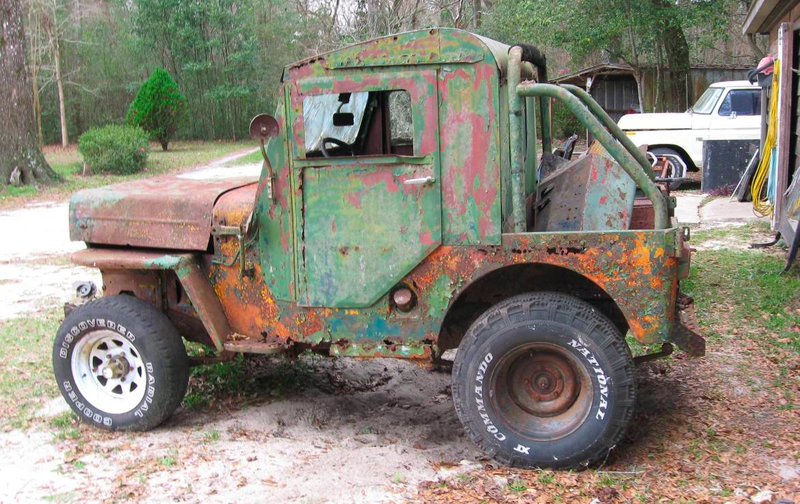 My favorite flat-fender Jeep is also considered, among most Jeepers, the ugliest: it’s the Willys CJ-3B. With its awkward high hood designed to house an overhead valve “F-head” motor, and its dorky looking grille, the ’3B is the ugly duckling in Willys’ storied Jeep history. But I dig it with a shovel. My god is it amazing. There’s no front bumper, a random horn appears to be tied to the grille, there’s what looks like a homemade leaf spring shackle reinforcement on the frame rail, the wheels are mismatched, the hood seems to be hinged at the cowl about an inch or two too far forward (or not at all), and the body is a beautiful blend of green, orange, red and rust. Plus, that little roll bar in the back, combined with what looks like a Worman Civilian Half “Jee Cab” top rounds out what is just an incredible display of automotive soul. It may not be “pretty” in the traditional sense, but you know this Jeep’s got some great stories. And that makes me want to take it back to David’s Home For Misfit Jeeps and nurture it back to health. The seller says the green/orange/red/rust Jeep above is really just a parts Jeep for the fairly decent blue CJ-3B in the photo above. Despite its workable body, the blue Jeep needs seats, a fuel tank, some lights, a windshield and a whole bunch more. If it were my $1,100, I’d use the blue one as the parts Jeep, and get the hard-top CJ-3B roadworthy, because just look at it. That junker looks like it belongs on a movie set; it’s amazing. It might not look like much in that grainy picture above, but underneath the sheetmetal is some serious hardware. The seller says the rear axle is a monstrous Dana 60, the front is a narrowed Dana 44, and both have 4.56 gears and Detroit lockers to keep the 38.5-inch tires gripping dirt. Under the hood is a 355 cubic-inch Chevy small-block V8, which sends power to a Turbo 350 and then to an NP203 transfer case that the owner says has been “converted to part time 4 wheel drive using a Doug Nash 1 piece mainshaft.” Apparently the transfer case allows for low range in four-wheel drive and two-wheel drive, which is pretty badass. The rig, which features a custom body with a fiberglass nose and fiberglass rear quarter panels, was built in 1979 and has apparently been owned by the same person ever since. Unfortunately, it’s missing a title and costs $6,000, which is a shame, because this monster Vega wagon—based on that single photo and the Craigslist description—looks like an incredible off-road machine. This one is completely different from what readers normally email me; check out the 1950s-era bus that Richard dug up on Craigslist in Alabama. As a GM “Old Look” style bus—especially one from that particular state—I can’t help but be reminded of the Rosa Parks bus, which looks similarly beautiful. The rounded, airstream-like shape; the recessed, tilted windshield; the copious oval skylights above the side rectangular windows; the bullet-shaped side marker above the folding, window-rich front doors; the big, curved front bumper; and the round recessed headlights sitting below protruding orange indicator lights make this bus a true work of art. At $3,000, I’d have half the mind to buy this if it had a title, and if it hadn’t been turned into a camper by a previous owner. It’s just downright cool. Speaking of campers, look at this free 1974 Caveman that reader Navid emailed me. The seller’s Craigslist post tells a hell of a story about how the camper wound up abandoned in a field in central California for the past 2.5 years. Apparently the current owners bought the Ford five years ago, when it was in great shape and “started first try every time.” After living in it for 2.5 years, they moved the truck to a rental property in Guerneville. Ever since, the truck has sat, despite the owners’ hopes to take the vehicle with them when they moved to Reno. But alas, the seller says in the listing, the moving costs were too high, so getting the truck into shape to get to Nevada just wasn’t possible. Now all the seller wants is for someone to take the two-double-bed-having truck off the property. The current condition of the truck is a mystery (the brakes are “soft”) but at that low, low price, you really can’t lose, here. That is, unless this is a scam, and the seller is in the business of harvesting human organs. I’d consider that a loss. Speaking of “really can’t lose,” a reader named Steve alerted me to the fact that there’s a 1976 Jeep J10 Honch Levi Edition for sale in California right now—someone who isn’t me needs to buy it right now. There’s sadly a seat cover over what doesn’t appear to be the original denim bench, the column looks to have been swapped at some point, someone screwed in some tie-downs on the bedsides, and the paint and decals look a bit weathered. But overall, with its razor grille, three-piece front bumper, brow cab, and fairly solid-looking body, this super-rare Jeep truck is probably worth $4,000-ish to somebody, assuming the truck looks as good in person and the buyer doesn’t care about the “parts only” title. Actually, screw that J10. Do as Jalopnik reader Christopher suggests, and spend your money wisely on this early SJ, a 1965 Wagoneer equipped with one of the first ever mass-produced American-made overhead cam engines: the Tornado inline-six. It’s not a particularly powerful motor, and it gets a bad rap in reliability, in part because it’s a bit more cumbersome to maintain than a flathead or pushrod motor. But who cares; this Jeep, owned by the same madman who’s converting a Jeep Liberty into a Wrangler, looks both supremely classy and also hilariously fun (I could see this thing parked at a country club, or with a few surf boards strapped to its top). That Rhino grille, that dark chocolate brown metallic paint, the bright red bench seats, the hood ornament, the red wheels with the chrome covers, the roof rack, the sun visor, the “three on the tree” manual transmission—there’s just so much to love, here. The fuel tank needs to be drained, the brakes need work, and some of the aesthetic bits need to be finished up, but—at least from the pictures—six grand seems to be a solid deal. I don’t know what to say about this 1975 Jeep CJ-5 Body On A Chevy S10 Frame rat rod that John emailed me. Standard Jeep features like four-wheel drive, any appreciable ground clearance, seat cushions and a hood seem to be missing. But it’s street legal, and there’s the rock-solid 4.3-liter 90-degree GM V6 providing propulsion. Is something as impractical as this $8,500-good? I don’t know; the idea of a slammed Jeep sort of makes me sick to my stomach, and also, I can’t put myself into the mind of someone who’d actually buy a rat rod. This one’s between you and your car gods; mine have told me to stay far, far away. These next two are pretty normal Jeeps. One, sent to me by Jake, is a 1987 Wrangler YJ with god-awful alloy wheels and a similarly god-awful Peugeot BA-10 five-speed manual transmission. The body looks great, and the 258 cubic-inch inline-six is a great motor. The thing is, if you want a YJ, get a fuel injected, 4.0-liter, post-1991 model; and if you do get an earlier YJ, it had better be significantly cheaper. This one, at $6,999, seems a bit on the high end unless the body and paint really are basically mint. The last two vehicles in this week’s volume of All The Craigslist Shitboxes Readers Have Been Tempting Me With Lately are small, 1989 pickups. The first, from Darrin, is a vehicle that makes my heart flutter: a Jeep Comanche, or MJ. This one needs a water pump and some body work, plus it’s got 225,000 miles on the clock (which is usually fine for this engine and transmission combination). A manual, four-wheel drive MJ for $2,000 isn’t bad, but whether that’s a good deal depends entirely on how much of the rocker panels and floorboards have been decimated by rust. Richard, who sent me that sweet 1950s GM Bus, also sent me this 1989 Mitsubishi Might Max, which might take the crown as the Deal Of The Week. Sure, it’s a four-cylinder, rear-wheel drive baby truck, but it’s a manual, and these trucks—based on my cursory research online—are known to fairly reliable. Yes, this little guy has been sitting for quite some time, but the body looks fine, the title is clean, there’s a bench seat, the trans is a manual, and—the most important aspect of this listing that takes it from “meh” to “great deal”—the seller is only asking $350. Three Hundred And Fifty Bucks. You can’t lose, here! Worst case, you scrap the baby truck and wind up breaking approximately even. Best case, you pick this thing up for cheap, and do what everyone should with a 1980s Japanese mini-truck: turn it into a truck-bed dancer.